Last night, sometime between the start and finish of dinner, my headache disappeared. My daylong discomfort and exhaustion were suddenly lifted. I don't know if it was the Ibuprofen, or the nasal decongestant that did the trick. I'm guessing it was neither. My theory is that my fresh New York bagel, full of carbs and covered with real butter, cut through the migraine. Forget Imitrex, this is the cure. Relief from that headache completely changed my level of engagement and I felt like a human being again. The rest of our night was great and I was able to give full attention to our guests. This morning I woke up headache-free, but I delayed my workout until after our guests had left. At that point, I thought about the benefit of resting versus getting in a run. I decided on rest, but not completely. 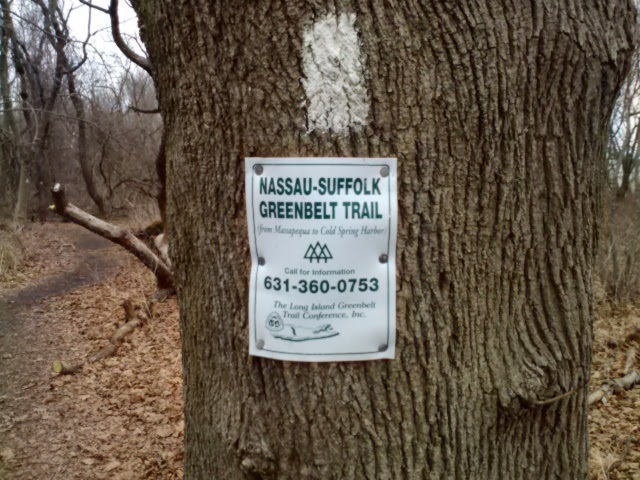 Around mid afternoon, my son and I decided to go for a hike at Trailview, a park that connects the Greenbelt Trail north of Jericho Turnpike. The skies looked dark and there was a little rain coming down. We put on hooded jackets and headed into the woods. Trailview, unlike Stillwell, is a simple layout with two paths. The segment between Jericho Turnpike and Syosset-Woodbury Road is closely contained so it's virtually impossible to get lost there. Still, Trailview's paths are interesting, with twists and turns and some steep inclines and descents. We saw a few other hikers braving the light rain, as well as a couple of trail runners. 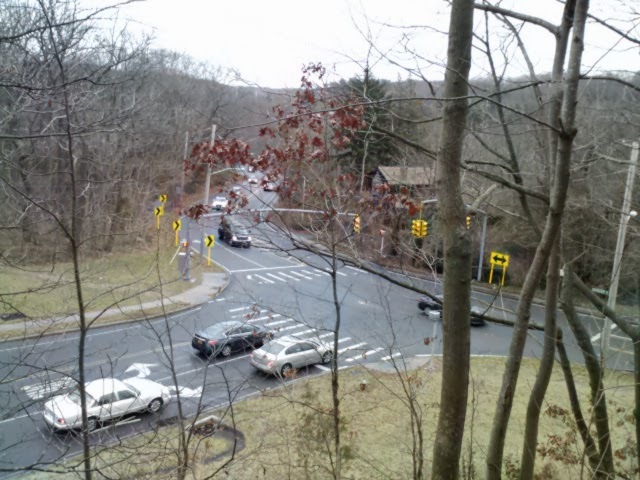 We ended up at the overlook where Woodbury Rd and Syosset-Woodbury Road meet. Crossing that intersection brings you into the south side of Stillwell Woods. For some reason, we've dubbed that "the view from Mount Olympus." At that point we headed back, talking the whole time about the history of PC's, handheld calculators and gaming systems, along with discussions about sentient computers and our common fascination with the movie, "2001: A Space Odyssey." 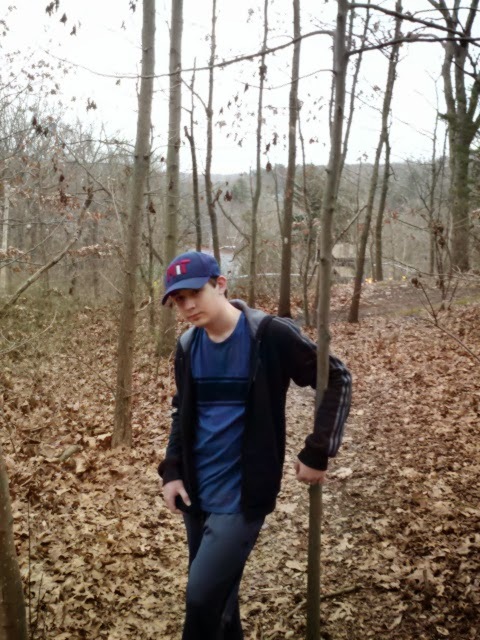 A hike in the woods with my son beat a run on the streets by a mile. The trails posed a few challenges, but nothing we couldn't handle. I got my workout without pushing so hard as to invite a relapse of yesterday's headache. All in all, a pretty good day. I'll have to decide whether to take tomorrow as my usual rest day or go for my first Christmas week run. "I know that you and Frank were planning to disconnect me, and I'm afraid that's something I cannot allow to happen..."